Windows 7 has several features that help you diagnose and treat the sickest hardware. 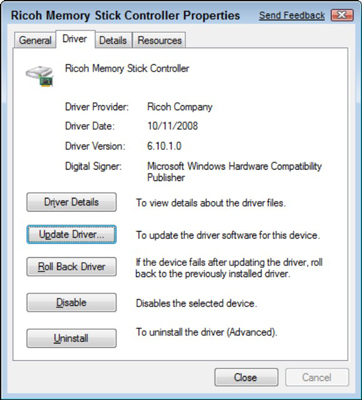 One of the best features to use when your hardware goes haywire is to revert back to a previous version of the driver. Computer hardware, like your CPU and printer, is cool. But when hardware goes wrong, you might be tempted to throw it out the window. Instead, use Windows 7 to isolate and troubleshoot the problem. Disconnect the device that’s causing trouble. Turn it off and let it rest. Choose Start→Control Panel→Hardware and Sound and click the Device Manager link. Click a device category to display the devices, and then right-click the device you want to roll back and choose Properties. The Properties dialog box, Driver tab. The Properties windows will open with the Drivers tab on top. Click the Roll Back Driver button and follow the instructions. If you’re still having problems with computer or piece of hardware, do a System Restore. This restores settings to a previous date when things were working correctly.